You Know You’ve “GOT MOLD”… Now What? Anyone can remove mold, but it takes a mold remediation professional to do it right. A. Roto Restoration will customize a treatment plan that eliminates the fungi from structural materials and kill mold using state-of-the-art equipment and EPA-approved cleaning agents to ensure your mold problem is resolved quickly and effectively. Our technicians have gone through extensive training programs to earn them an IRI Certification stating that they follow all safety guidelines and that they uphold and exceed all industry standards. We also follow all EPA and OSHA protocols. Our mold “remediation” is a five step process consisting of assessment, containment, filtration, removal and repair. It is critical to identify the source of the moisture and assess the severity of the problem before remediation begins. Our experts will check not only the surface areas, but also every possible area where mold growth can hide. Once the mold remediation process begins, we will close off the affected area using plastic sheeting and tape to avoid contaminating the rest of your property. To scrub the air clean of mold spores and particulates, we use air filtration machines with HEPA filters. We wear protective suits, goggles and full face respirators to avoid absorbing too many of the particulates. When containment has been successfully achieved, we proceed with mold removal. Insulation, drywall, carpet, flooring, furniture, and other mold infected items will be removed to prevent mold from returning. Our goal after mold removal is complete is to return your home as closely as possible to its pre-loss condition like nothing ever happened. All of our repairs are performed by our in-house professionals so you can be sure all repair jobs will be done right and in a timely manner. At A. Roto Restoration mold is our specialty, it’s what we do. Our goal is to provide high quality mold inspections, mold testing, and mold removal and remediation services for various types of mold, including toxic black mold. We are committed to addressing your mold concerns with experience and professionalism. As a result, a high percentage of our business is generated from referrals. 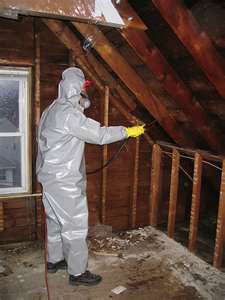 We want to be your choice for mold remediation. If you are anywhere in the Chicago area call A. Roto Restoration today at ­­630­.­543­­.­0668­­ for your free consultation. Credit cards are accepted. You’ll remember only how good your home or business looks after our services.